Written by Brook Reilly. December 7, 2014. Winter is upon us in Cleveland, and those of you with fireplaces have probably already lit them a few times this year. But here's a serious question for you: Do you have fireplace doors? Because you really should. There are three main reasons that fireplace doors are important. Fireplace doors protect your home and your family. They create a barrier between burning hot flames and inquisitive children/pets. They also keep the hot embers and sparks from you fire contained to the fireplace, and not on your flammable floors. Have you ever felt a cold breeze blowing down your chimney into your house? Or noticed that the hot air in your warm home is somehow escaping though your fireplace? Fireplace doors prevent this by creating a thermal barrier between the air in your house and the outside air in the fireplace, so you won't be fighting constantly to maintain the temperature of your home. Let's face it. The right fireplace door can add class and charm to your living space, at a very reasonable cost. How can you go wrong? 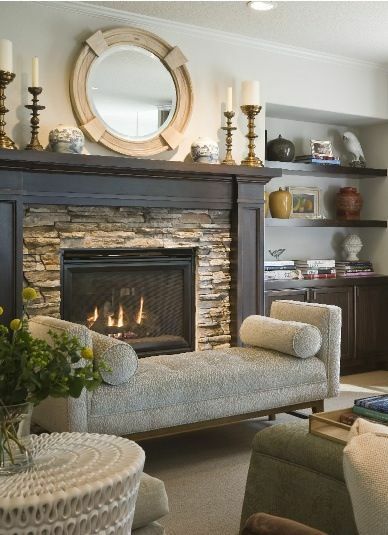 With their prevention of injury and property damage, their improvement on energy efficiency, and their undeniable decorative style, fireplace doors may very well be the perfect home improvement this winter. For more information on fireplace doors, check out this article. Photo courtesy of HGTV.